Microsoft recently modified their DR-in-the-cloud service, Azure Site Recovery, last week to accommodate small-to-medium enterprise businesses and branch offices that run Hyper-V without System Center Virtual Machine Manager. As of December 11, you can now replicate Hyper-V virtual machines, with or without System Center Management into Azure and use Microsoft’s disaster recovery site as a low-operational cost, no capital investment, disaster recovery site. In particular, Microsoft designed HVR for small-to-medium enterprises (SMEs) with the ability to scale up. It was great that Microsoft gave SMEs a replication tool for free, but the problem for most organizations of this size is that they don’t have a place to replicate to. Microsoft had effectively closed the doors on the large percentage of the market that had Hyper-V and required an affordable disaster recovery solution that Azure could offer. On December 11, Scott Guthrie, Executive Vice President of the Cloud and Enterprise group in Microsoft, announced that Azure Site Recovery would now support replicating Hyper-V virtual machines without requiring SCVMM, referring to it as “Disaster Recovery (DR) to Azure for Branch offices and SMB.” SMEs, the part of the market that struggles most with the cost of a disaster recovery site, finally have an affordable way to implement business continuity by using Azure as their disaster recovery site in the cloud, with all the same one-click orchestrated test, planned and unplanned failover functionality that the Fortune 1000’s can get in Azure. How Affordable Is Azure Site Recovery? A disaster recovery site placed in a colocation hosting facility, requiring capital expenditure for almost identical server/storage/etc hardware and a monthly cost for the hosting services. I calculated the monthly costs of each solution. In the case of the hosted disaster recovery site, I divided the CAPEX costs by 36 to spread the investment over three years. Note that the trickiest part of this was to price the cost of storage transactions, but that cost is tiny so there is a lot of room for error. The result says a lot. This fictional customer can get a traditional hosted disaster recovery site for around €4,277 per month, but they’ll need to pony up €46K of capital investment up front to build the disaster recovery site. Getting that sort of cash is a challenge for a SME even when the economy is doing well. 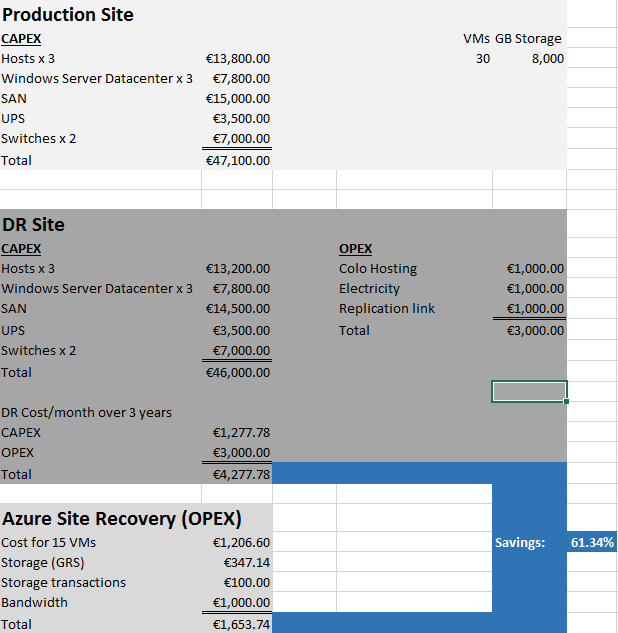 If that customer went with Azure as their disaster recovery site, then the solution would cost around €1,653 per month. That is not only 61 percent cheaper per month, but there is no need for any capital investment. This is a more manageable operational cost and under open licensing, there is no long-term commitment that the customer cannot divorce themselves from. In my opinion, the launch of ASR without requiring SCVMM will be a hot feature of Azure to watch in 2015 for SMEs and Microsoft partners that operate in that space, and the temperature will only increase when Microsoft adds replication-to-Azure support for vSphere.